This was the most money I have ever spent to run a half-marathon. The cost was $175 per runner and $150 for student runners. The race was a lottery so you had to sign up in December and win the lottery to be able to run the race. Students got in without signing up for the lottery. I would normally give a race an F for being this expensive but someone has to pay for all these Tiffany’s necklaces! Plus, I do believe that it was worth the money, you will see why below. After entering you walked through an expo filled with women’s apparel and products. 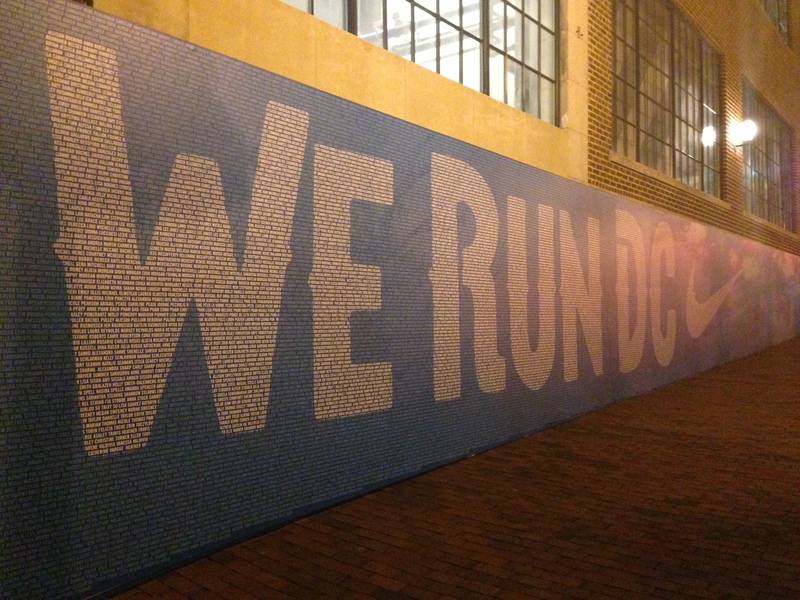 There was a big replica of the Capitol Building in which runners were encouraged to write positive words on and sign for the race ahead. This also showed up on the race course which I thought was awesome! At the expo, race volunteers urged you to walk over to the Nike store in Georgetown to view the finisher’s medal. At the Nike store, there was more race apparel and a glass case that held the finisher’s medal. 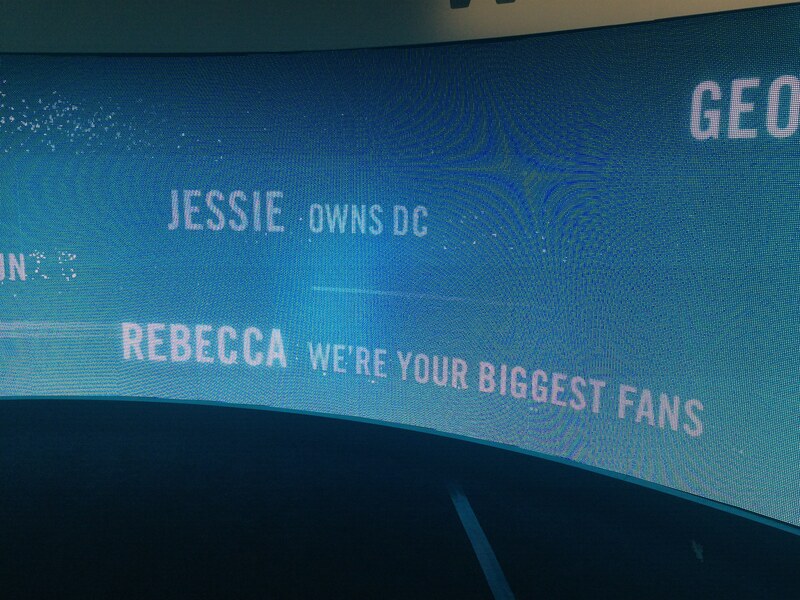 They also had this HUGE banner (see below) which said, “We Run DC”. If you look closely, the name of every race participant is written within the banner. SO COOL! The personalization of this expo was amazing! Washington DC is one of my favorite places to run. It is a runners dream with all the distractions us curious runners could ask for. From the Washington Monument to Arlington National Cemetery, there is so much to see here and it is spread out! Often times I find myself literally going the extra mile just to explore another monument. I really do love to run here. Unfortunately, my own personal ‘fun runs’ always seem to be a little more exciting than the races I run here. This course was good but it could have been great. The first mile of the race you run to the Capitol Building, which I absolutely love and which is a great place to get pictures (see picture below.) Some highlights of the course were a long tunnel that you ran through. This was a lot of fun as women cheered and screamed while running through. Part of the race was along the water, which was a nice change of scenery. My wish was that there were more views of the monuments along the way. The course was easy and very flat, which I love! There were A LOT of participants in this race. The participants were mainly women. Some men did run the race also. The participants were nice and friendly but not overly talkative. I felt as though the runners were mostly there to have fun, not too many serious runners there. The spectators of the race were great, especially during the last mile. They were loud, held up signs, and were encouraging. The reason they get a B is because they were not well dispersed along the course. There were long chunks of the race with no spectators at all. The finish of this race was amazing. You were right in the heart of DC and nothing forces you to sprint across the finish line faster than men in tuxedo’s holding Tiffany’s little blue boxes on a silver platter for you. YOUR FINISHERS MEDAL IS A TIFFANY’S NECKLACE DESIGNED SPECIAL FOR THIS RACE! I absolutely love it and it is my all-time FAVORITE race medal! 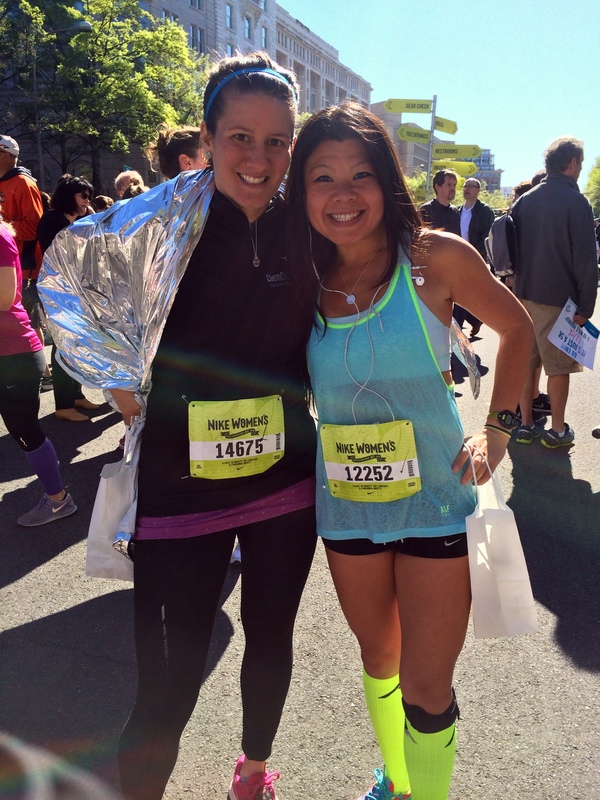 Here is a picture of my friend, Amy, and I post-race with our new finisher’s necklaces on! The post-race area also had snacks, drinks and places to take post-race photos. The race results were easy to access them, as you could almost immediately get them on your phone after the race. THE BEST part of the race, aside from finishing and getting a Tiffany’s necklace, was that they surprised you with FREE RACE PHOTO’S! I have never purchased my race photo’s but always would love to get a photo of me in action. I was so happy to get free race photo’s and they took REALLY AMAZING pictures with beautiful scenery. 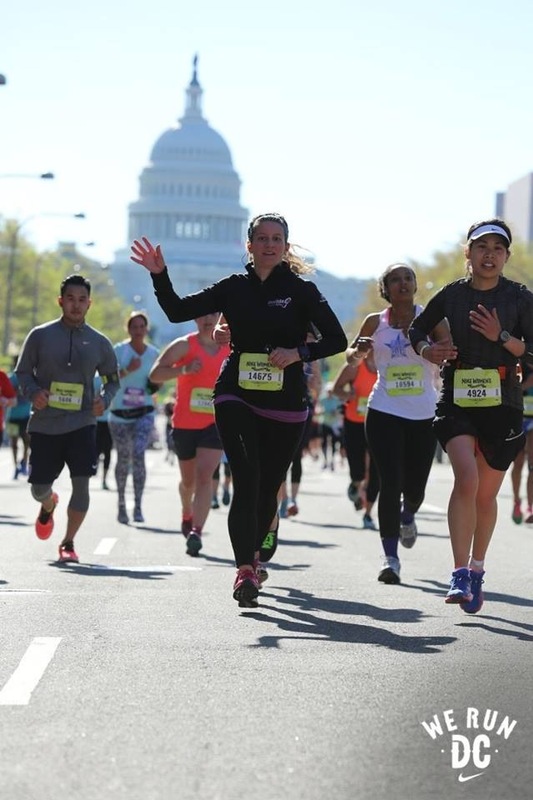 Check out this one of me running with the Capitol Building in the background. Good thing I thought to wave! I couldn’t ask for a more awesome race photo! This was a HUGE perk that I was not expecting! This is a race that I would definitely recommend to other female runners. I think Nike really got this women’s race right. It took into consideration what women runners want and need. 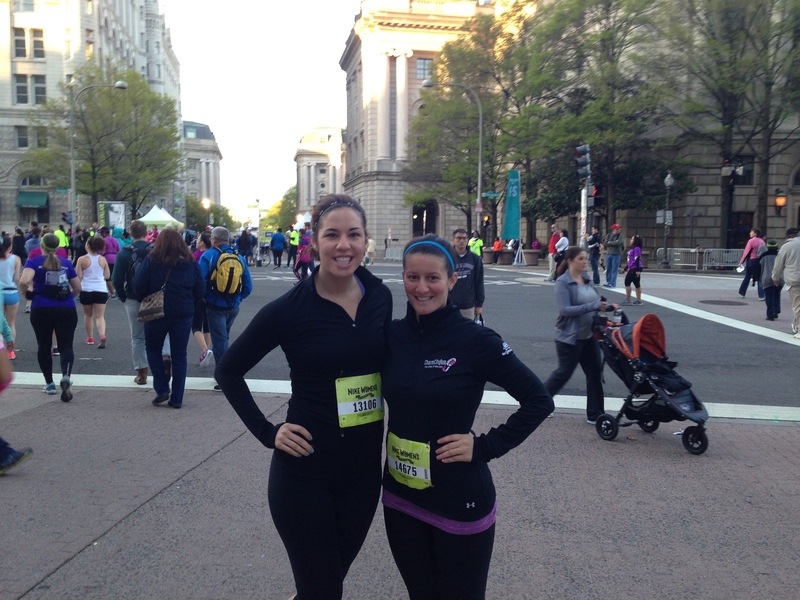 The race apparel and expo were both strongly geared towards women. 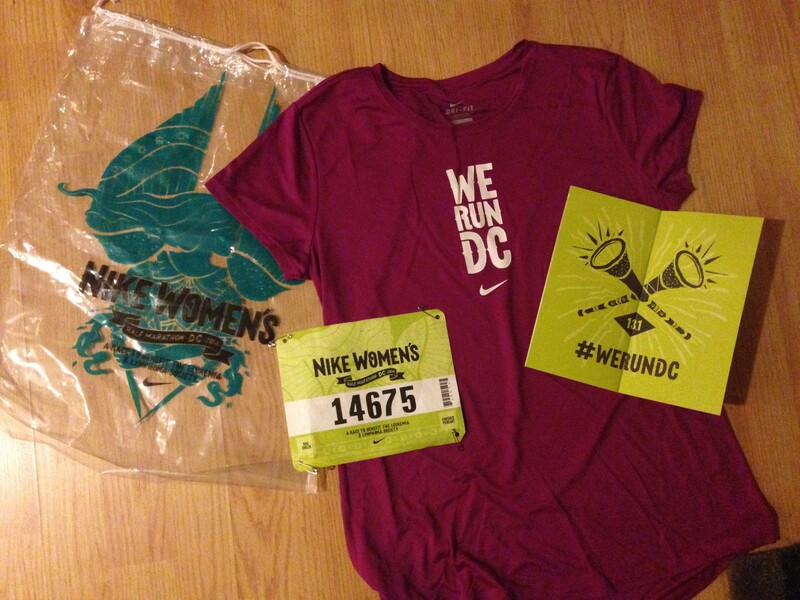 The race swag was perfect for women. The amount of bathrooms was adequate. The finish line and after party was a woman’s dream. I think they did a really good job of encompassing what women want in a race. Unfortunately I heard a rumor that Nike was not going to hold a their women’s half marathon in DC in 2015 so I have no where to send you to sign up for this. If anything changes, I will let you know!